Oakland, CA -- With less than two weeks to go before the 2018-19 school year begins, schools across Oakland are getting ready. At Melrose Leadership Academy (MLA), work is now underway to make the campus more green and, in the process, help children learn. Oakland Unified School District (OUSD), The Trust for Public Land, and Green Schoolyards America announced their partnership at MLA, the first of five schools to serve as demonstration sites where asphalt covered schoolyards will be transformed into green or “living” schoolyards. The partners will also collaborate on a district policy, funding strategy and joint use agreements to ensure more OUSD’s schoolyards become healthier and more climate resilient. “Working with The Trust for Public Land, Green Schoolyards America and the community provides Oakland Unified School District with added resources and technical expertise that we need to improve the learning environment for our students,” said Kyla Johnson-Trammell, OUSD Superintendent. The partnership focuses on increasing equity across the OUSD by prioritizing schools that serve low-income neighborhoods. The five demonstration schoolyards (Emiliano Zapata Street Academy, Markham Elementary School, Melrose Leadership Academy, Ralph J. Bunche High School, and two elementary schools that share a campus, International Community School and Think College Now) will receive community engagement, participatory design, asphalt removal and planting. The demonstration schools will also benefit from professional development from the Green Schoolyards America’s Principals’ Institute. Nearly 1,700 students attend these five schools and will directly benefit from the transformation, and a total of 30,000 people live within a 10-minute walk of these sites. 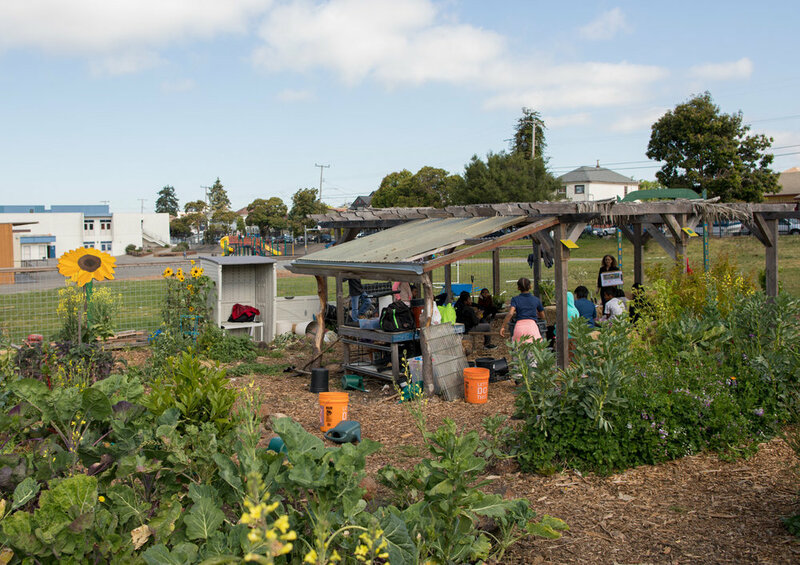 This new partnership with Oakland Unified School District, Green Schoolyards America and The Trust for Public Land builds on an existing strong garden program in the District. In this photo, students at Hoover Elementary School Learn to about climate by measuring the temperature of their grounds, under the guidance of Sharon Danks and garden teacher, Wanda Stewart. Photo credit; Paige Green. 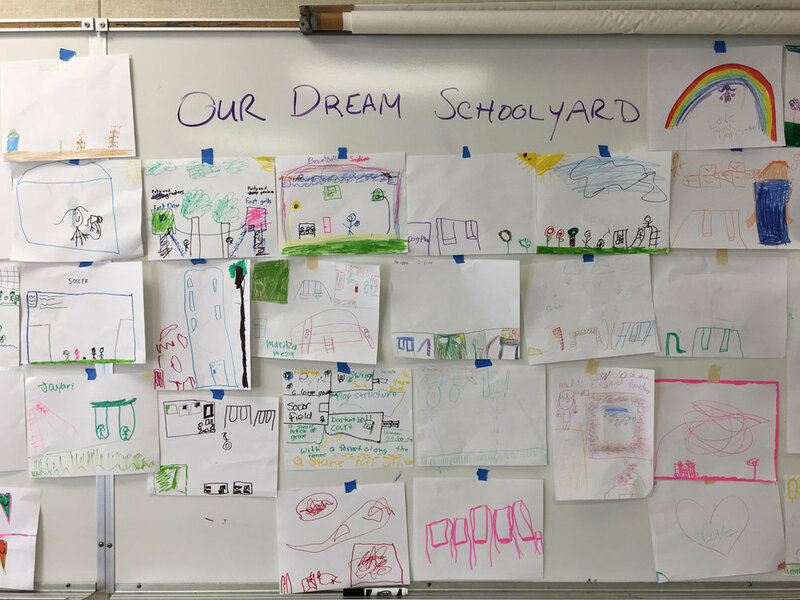 student drawings from a schoolyard design workshop earlier this year at Markham elementary school in oakland, led by Trust for Public Land and Green Schoolyards America. Generous funders have provided key contributions toward this effort. The California State Coastal Conservancy Proposition 1 competitive Grant Program has provided a $566,000 grant to The Trust for Public Land. Other major contributors include Kaiser Permanente Northern California and the Hellman Foundation. “This pilot of transforming asphalt-covered campuses with gardens and nature-filled outdoor classrooms will create beautiful park-like spaces that will inspire students and stimulate their creativity, as well as result in a healthier learning environment. The Hellman Foundation is delighted to support this partnership which will benefit thousands of students in Oakland and serve as learning opportunity for expansion across the district,” said Susan Hirsch, Executive Director of the Hellman Foundation. The Trust for Public Land creates parks and protects land for people, ensuring healthy, livable communities for generations to come. Millions of people live within a 10-minute walk of a Trust for Public Land park, garden, or natural area, and millions more visit these sites every year. To support The Trust for Public Land and share why nature matters to you, visit www.tpl.org. To learn more about OUSD’s Full Service Community District focused on academic achievement while serving the whole child in safe schools, please visit OUSD.org and follow us @OUSDnews.